The two fancy lamps at the western limit of the New Lamp Zone have received their black paint but they are still waiting for their golden stripes at street level (and their numbers). Meanwhile, lamp No. 11 near the Grey Horse is still its original blue and it seems to have been forgotten completely. 46: Still got the blues! Fancy lamps 14 (above, left) & 15 at the western limit of the New Lamp Zone have received their gold trim but they are still waiting for numbers. Meanwhile, lamp No. 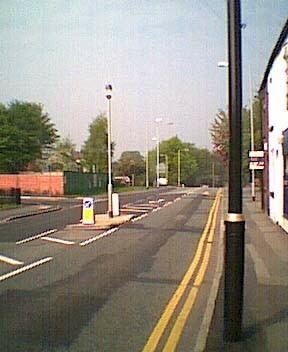 11 on Stockport Road near the Grey Horse pub (above, right) has not been touched since it was installed. There can be no doubt that it has been forgotten completely  as have No. 86 (left) and No. 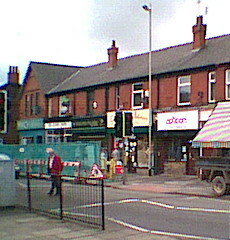 84 (right) on Compstall Road. They should be Nos. 10 & 12 respectively under the revised scheme, but the cowboys seem quite happy with their slap-dash numbering system. 47: Confederate Grey at last. Getting there but very slowly. We understand that Romiley residents have been showering their Triv-Dem local councillors with emails since our last posting. 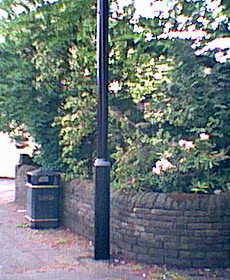 They've been asking for the reason why the cowboys running the new lamps project have omitted Lamp 11 on Stockport Road from the painting programme. We haven't heard of anyone getting a reply yet but No. 11 is now wearing a coat of grey undercoat and full lamp post uniformity seems to be on the way. Eventually. 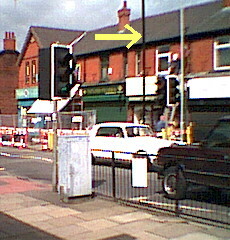 In the meantime, Lamps 86 & 84 on Compstall Road still haven't been renumbered. 48: Excruciatingly slow fade to black. 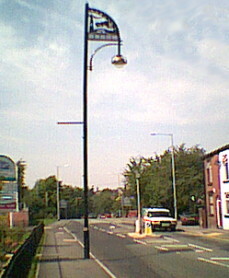 New Lamp 11 on Stockport Road has been painted black at long last. But sharp-eyed lamp post spotters will note that it still has a horizontal stripe of grey undercoat showing where the base steps down in diameter to the pole. Which means that the painters will be making yet another trip to Romiley to apply the gold trim (to make it match the nearby litter bin) after the black coat has hardened. 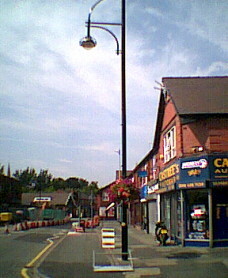 Romiley's local taxpayers are probably wondering how much extra it costs to paint lamp posts one at a time instead of tackling the whole lot of them as a group. Romiley Arts Federation wishes them luck in dragging the information out of Stockport Borough Council! 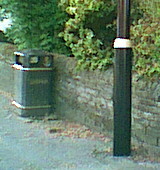 49: Matching Litter Bin & Lamp Post. 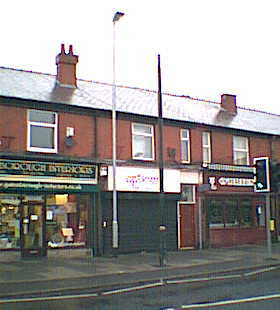 Okay, so New Lamp 11 on Stockport Road has its gold stripe now. 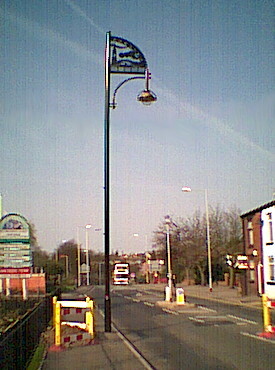 So what about finishing the bloody job and putting numbers on the last 3 new lamps of the set, Stockport Council? It seems incredible that this job has dragged on for 65 weeks now, since the last week of February 2003. Could it be that Stockport Council is looking for a place in the Guinness Book of Records by setting a world record for foot-dragging on a public project? 50: One of our new lamps ... is history! 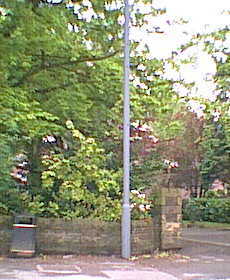 New Lamp 6 on Compstall Road (yellow arrowed, left picture) has been kidnapped by the gangs of invisible workmen, who are busy fencing off bits of the pavement and creating an obstacle course for the entertainment of Romiley's pedestrians. The replacement, seen in all its glory in the picture on the right, is decidely unfancy. 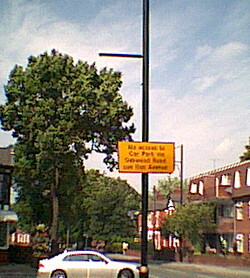 51: They're messing about with the new lamps again. The cowboys have been at it again  going round the surviving new lamps and fitting them with a tubular bar about 15 feet off the ground on the pavement side. And as we have a bunch of cowboys doing the job, they missed one! 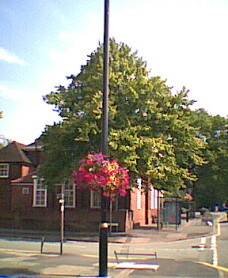 The 2 pictures below are both of Compstall Road new lamp 7, which has hanging baskets but no bar. UPDATE 2004/08/15: What is going on here? After they had fitted tubular bars to all but one of the new lamps, some cowboy had second thoughts and sent the workmen back to remove the bars from the pairs of fancy-topped new lamps at either end of the new lamp zone. 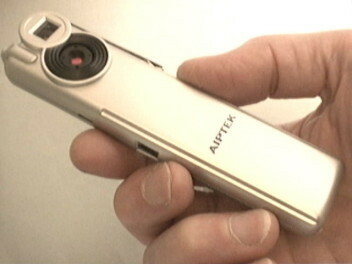 So the picture on the left of this pair (taken 2004/08/08) is probably the only one in existence of No. 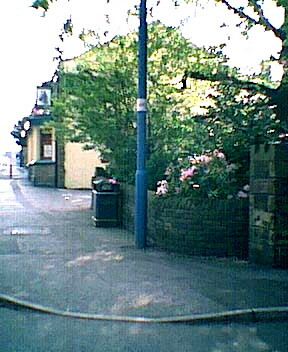 16 on Compstall Road with a bar. 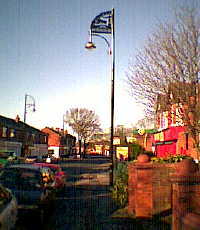 This lamp is shown without its bar again in a picture taken on 2005/02/19. And the picture on the right of the top pair in this section is probably the only one No. 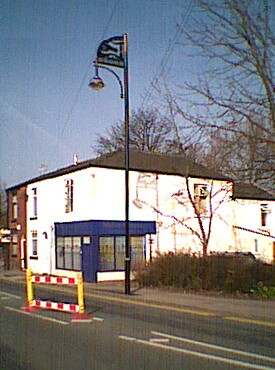 15 on Stockport Road with a bar. The sewer repair marathon has been completed and, after over 4 months in storage, new Lamp 6 on Compstall Road is on its way back. The base was restored in a decidely sorry, scratched condition. 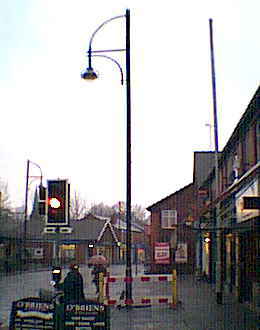 So Romiley's lamp-watchers are wondering if it will get a new coat of paint after it has been topped off, and whether it will get a golden number and a tubular bar, as this lamp was removed a month or so before the bars were fitted. Great excitement in the village when some men dug a hole around the base of Lamp 6 and the painters' van with the hydraulic arm turned up. And then nothing much happened. The painters' van pushed off again. The lamp acquired a couple of barriers and a black plastic bag, which was wrapped loosely around the door in its base, and the top part with the light unit remains missing in action. Strange how nothing happens on nice, sunny days but the moment the weather turns nasty, the workmen turn up for an outdoor job. This lamp is back in one piece now and Romiley's residents are waiting to see if our Local Libs will get the lamp job done propertly at long last. The outstanding jobs include repainting this lamp (obviously) as it has clearly had a tough time in storage; harmonizing the lynch-bar situation, and doing something about the numbering system. 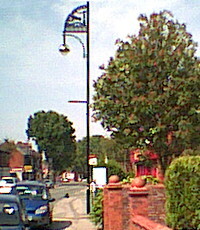 The lamps still have numbers from two different systems and the painting of some of them on Stockport Road was delayed for so long that they never, ever got numbers. 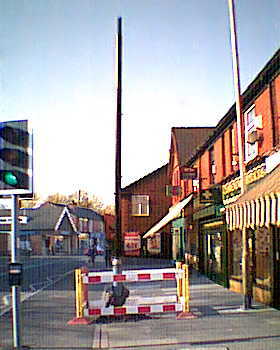 It is now two years since the council started messing about with Romiley's street lighting; and we're taking no bets that the job still won't be completed two years from now! Created for Romiley Arts Federation by HTSP Web Division. 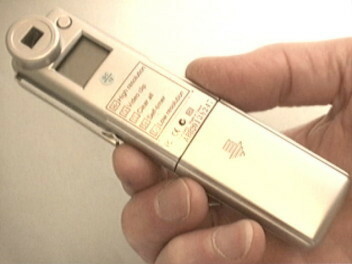 © RAF, 2005.